Here's the website for easy online registration and below is a summary of the free bonus events. Flier attached. 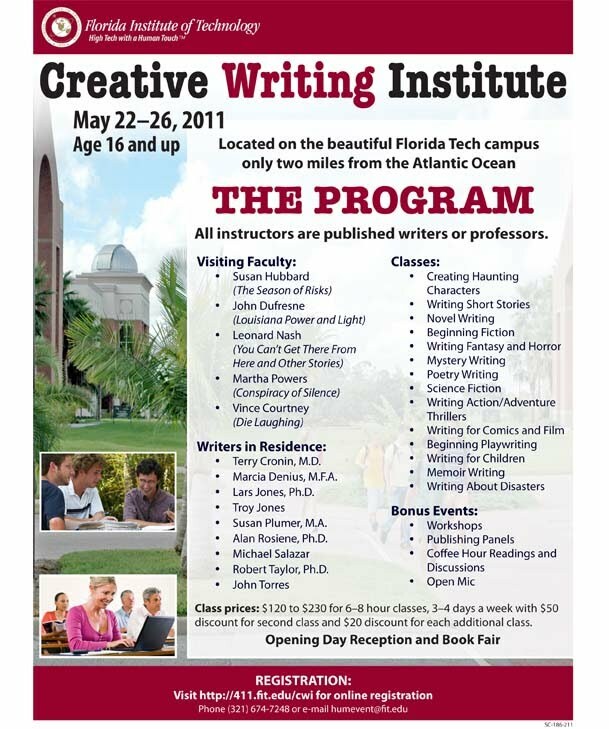 MELBOURNE, FLA.—Filled with a variety of free events, the Florida Institute of Technology Department of Humanities and Communication presents its Third Annual Creative Writing Institute, May 22-26 on campus. All the following events are free of charge and no RSVPs are necessary. This year’s keynote speaker is novelist Susan Hubbard. Her presentation, “Transcending Genres,” will be on May 22 at 2:15 p.m. in the Gleason Performing Arts Center. A reception, registration, orientation and book fair, starting at noon, precede her talk. 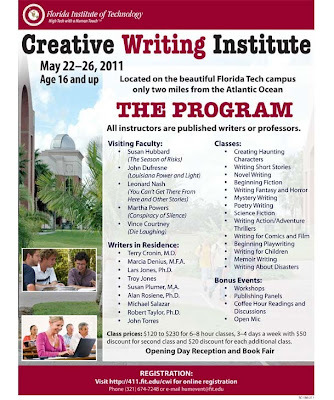 Hubbard, a professor of English at the University of Central Florida, is the author of seven books, including her popular Ethical Vampire Series. This encompasses The Society of S, The Year of Disappearances and The Season of Risks. Leonard Nash, author of You Can’t Get There from Here and Other Stories, will be the lunch speaker on May 23, 12:10-1:10 p.m., in the Hartley Room, Denius Student Center second floor. Also that day, from 4 to 5 p.m., a publishing panel will address writers of every genre and level of experience. Panelists will be Susan Hubbard, John Dufresne, Leonard Nash, Mike Salazar, Vince Courtney and Martha Powers. From 5 to 6:10 p.m., John Dufresne, the 2010 Creative Writing Institute keynote speaker, will read from his novels, also in the Hartley Room. On May 24, 12:10-1:10 p.m., Terry Cronin Jr., M.D., the lunch speaker, will read from The Skinvestigator: Tramp Stamp. The dinner speaker, from 5 to 6:10 p.m., will be Susan Hubbard who will read from one of her novels; both events are in the Hartley Room. The May 25 lunch speaker, 12:10 to 1:10 p.m., will be Martha Powers, reading from one of her novels. At dinner, 5 to 6:10 p.m., Vince Courtney will read from his works and, from 8:45 to 10 p.m., local film-maker and writer Cronin will present a screening of his independent film, Adventure Chefs; all this day’s events are in the Hartley Room. Finally, on May 26, Michael Salazar will share one of his action adventure novels from 12:10 to 1:10 p.m.; John Torres will read from his works at dinner from 5 to 6:10 p.m., and Open Mic, led by Pamela Gieswein from 8:45 to 10 p.m., will offer a creative celebration of artistic talent from anyone attending who would like to participate. All this day’s events are in the Hartley Room. For those who wish to enroll in specific classes of the institute, offered for a fee, class sizes are limited and early registration for these is recommended.